Are wild horses at risk of being sterilized due to an advocacy campaign? Is something in that form letter you received that you don’t agree with? Do you want wild horses sterilized using EPA approved restricted use pesticides? These pesticides are not safe for domestic horses so why are they being pushed for use on wild horses? Are you giving up the fight for their freedom to live in natural family bands? Why is an advocacy group encouraging their supporters to write members of Congress–via click and send form letter–asking them to sign on to the pledge to sterilize wild horses (already in non-viable herds) when BLM overpopulation claim is false? Even worse is the pledge they are requesting members of Congress sign and return the advocacy group’s office. Senators and representatives will take that to mean you want “[porcine zona pellucida (PZP) vaccines and GonaCon™ vaccine for females and chemical vasectomy for males] either alone or in combination”. Is that what you want? Or do you want a 10-year moratorium (suspension) on roundups for scientific research to investigate what’s the best way to manage the underpopulated herds of wild horses left in the West? Why is this group pushing an elected official “pledge” to use “available fertility control” without scientific studies on population, migration, and holistic land management? What is going on here? Who is funding this scare-tactic-based campaign to sterilize America’s wild horses? Why isn’t the group mentioning to Congress that the National Academy of Sciences report also said there is “no evidence” of overpopulation–why omit this? Why hasn’t the group done any independent aerial or in-the-field research on population? Is it because it would not support the BLM’s faulty overpopulation claim? The group appears to know wild horses are not overpopulated. Recently they were quoted in an Associated Press article debunking the BLM’s overpopulation claim in comparison with livestock on public land. 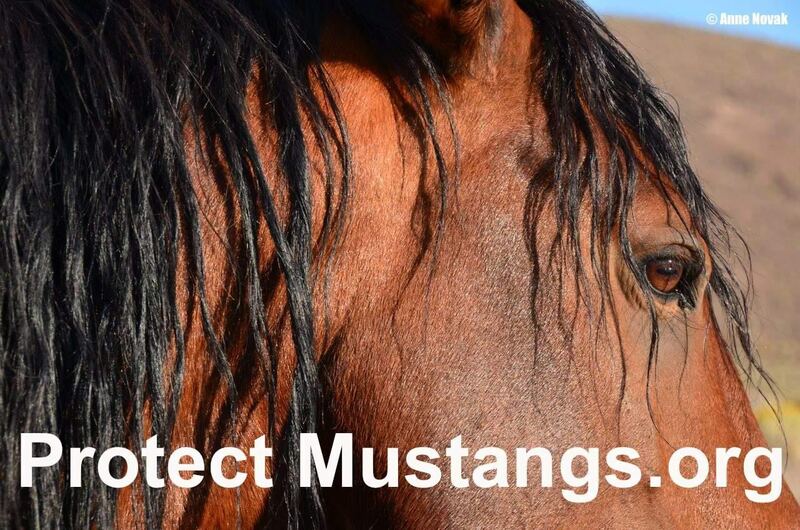 Why then are they attempting to lead the public into blindly supporting a plan lacking good science–a plan calling for permanent and temporary sterility actions against indigenous wild horses? Is the group eluding to a false risk of all wild horses going to slaughter if they aren’t sterilized? Why create all the panic so people will quickly click, sign and share the pledge with their senators and congressmen asking them to “take the pledge” for sterilization, etc.? Is the public reading what they are signing on to? Many other valid concerns about PZP were brought up in this 2010 article as well: http://www.horsetalk.co.nz/news/2010/10/220.shtml#axzz2tlL9dGaX More articles will be posted soon. How can man (BLM and others) decide which wild horses to sterilize on the range and who to breed? That would be the end of survival of the fittest and the beginning of domestication of the wild horse and burro. Is the group’s paradigm flawed because it focuses on the individual wild horse and neglects to view the herd as most important–as the lifeblood? Sanctuaries might need to sterilize wild horses because they have limited space but policy for native wild horses living in the wild should not be modeled after a sanctuary model–unless it is based on reserve design. The alleged overpopulation problem for wild horses and burros is a farce. Now the question is–What do we do to save the wild horses from those who are pushing for risky temporary and permanent sterilization using EPA approved “restricted use pesticides” on non-viable herds? 1.) 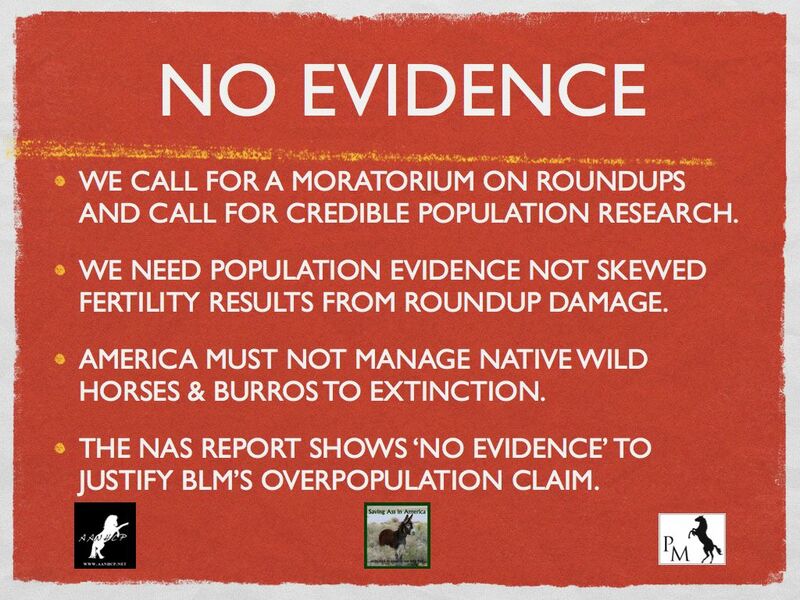 Sign and share widely the petition for a moratorium on roundups for scientific research. Good science will find real solutions to protect wild horses and burros on the range. 2.) Send an email to your senators and your representatives if you don’t want America’s wild horses to be sterilized. Let them know you didn’t read the fine print of the form letter you signed if that is the truth. 3.) Meet with your senator’s aides and your representative to request they intervene in the wipe-out of America’s wild horses and burros by granting a 10-year moratorium on roundups for scientific research on population, migration, reserve design, holistic land management, etc. Remember don’t let anyone scare you into believing wild horses are going to be slaughtered if they aren’t sterilized. Fight the good fight for our symbols of freedom and our national living treasures–America’s wild horses and burros. The star studded documentary by James Anaquad Kleinert requests a moratorium on roundups . . .